If you are trying to lose weight or allow your hard-earned muscle show through, you may be wondering how much body fat you are carrying around and how much muscle mass you need for optimal health and fitness. Learning about your body composition is key in achieving your best appearance and knowing which direction to take your diet and exercise. The scale only tell us our weight. It doesn’t give us an inside peak of is actually going on inside our bodies. Monitoring your body composition as you are making changes in your diet and exercise is going to take the guess-out out of wondering, “Is this really working?” Let me give you a few examples of why this important for everyone, despite your size or goals. When I was in college studying to become a dietitian we practiced measuring each other’s body fat percentage. It was surprising to discover that the “tiniest” girl in my nutrition class had the highest percentage of body fat, while the “heaviest” girl in the class had one of the lowest. Everyone was shocked! How could this be? One girl was so skinny that she was still able to shop for jeans in the GAP kids department! She was naturally thin and had never worked out in her entire life. After discovering this about herself, she had her cholesterol checked , and her LDL “bad” cholesterol was elevated. Although the other girl was slightly overweight, she was always in her workout clothes coming straight from the gym and had acceptable cholesterol levels. I mention this because sometimes our outside appearance doesn’t accurately reflect what’s going on inside. You can appear overweight and still be fit with a healthy body fat percentage, or you can be “skinny fat,” which is appearing thin but with an unhealthy percentage of body fat. I used to work at weight control center, where we did body composition testing on everyone on the first day they came in. Wow, what an eye-opener! This would help us determine how much body fat they had to lose and establish their initial pounds of muscle mass. We would repeat their body composition testing every 30 days to monitor exactly where their weight loss was coming from. I could see how much of their weight loss was water, how much was fat, and make sure that they were preserving all their muscle mass. I could tell if they weren’t exercising enough, eating too few calories, or not enough protein. I took everything I learned about the art and science of weight loss and body composition and applied it to my own weight loss and fitness goals. Within 4 months of starting to work at the weight loss center, I was able to reduce my body fat by 9%! Like most women, I tend to carry my weight around my hips, thighs, and buttocks–which we know is less dangerous than the belly fat, but it’s still really annoying! Even though I looked “thin” my body fat percentage was unhealthy. This was a wake-up call the that the late night cheese and chocolate treats were adding up. When you are a dietitian, everyone expects you to be thin and lead a perfectly healthy life. My clients look up to me to lead a good example, so I was determined to get my body fat percentage down to the healthy range. I designed a diet and exercise routine for myself that help me lose weight and reduce my body fat by 9%. At the age of 32 of was in the best shape in my life and for the first time since I was 17 years old I didn’t have cellulite! I always thought that there wasn’t a cure for cellulite and that I was just going to have to accept it for the rest of my life, so I was thrilled that I was finally able to get rid of it! But the results don’t last forever unless you work hard to maintain it. If I start to slack off on my diet and exercise, it starts to show again. But it’s not just about vanity and boosting your self-confidence. Having excess levels of body fat puts you at risk for diabetes and heart disease, which trust me you do NOT want! Having a health or fitness professional measure your body composition will enable you to more effectively set goals towards achieving and maintaining healthy levels of muscle and fat mass. I always say: knowledge is power. If you understand how your body is changing, you can manage problems before any major health complications incur. By using body composition testing you can see how much fat you are losing while making sure you are preserving your valuable muscle mass. In order to find out your body fat percentage and lean muscle mass through body composition testing, you may want to do some research to help you choose the body composition test that suits you the best. Below are four different types of body composition testing methods for you to consider. 1. DXA Scan (Dual-emission X-ray absorptiometry): This dual X-ray system is the current gold standard in body composition testing. You lie on a table fully clothed while a small dose of radiation passes through the body, distinguish fat from muscle from bone. You need a doctor’s prescription to get this scan done and the test can be rather expensive with a 3-5% precision error. Since this scan is able to measure intramuscular fat, the results can show 3 to 8 percent higher body fat than other methods. 2. Bioelectrical impedance: This the method that we used at the weight loss center and that I have personally done many times. I like it because it’s quick and easy, however as with all body composition testing, hydration status can effect accuracy. You stand on a scale like machine and grab onto two metal arms where electricity flows through fat and lean body mass. If you are dehydrated or menstruating, the test will be less accurate and will overestimate your body fat. Overall accuracy tends to fluctuate +/- 5%. 3. Underwater weighing (also known as hydrostatic weighing). This test is done under water after exhaling completely. The limitations of this test which can affect the accuracy include people have difficulty exhaling completely before being dunked under water and bone mineral density varies considerably from person to person, since big-boned people may have more air in their bones. This test is considered highly accurate with only a +/- 2-3% error. 5. 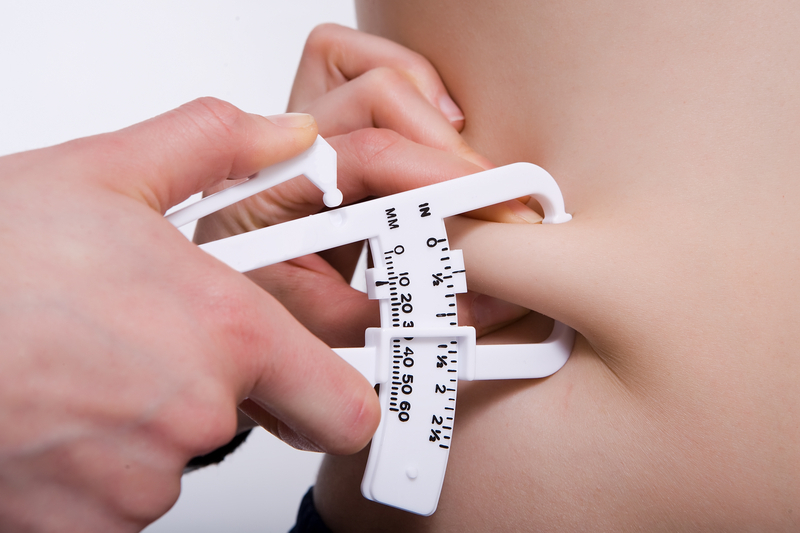 Skinfold caliper testing: This test is not technologically advanced as it simply involves pinching the skin to measure excess fat in specific areas of the body. The results are highly dependent on the person doing the testing and the quality of the calipers used. This method is the least expensive and is often offered for free at local gyms, but is also considered the least accurate due to a possible +/- 7% inaccuracy. Whether you just amped up your workout routine and are trying to lose weight or you are just contemplating getting started—it is important to asses where you are currently at in order to set goals for yourself. While consistent weight monitoring is important to be aware of and keep you in check, it does not provide a complete physical fitness picture from the inside out.